Selfish Orion and its sons who are also selfish are doing evil deeds in the unseen world is shown by this Crop Circle. Its sons are Snake charmer seat and Sirius BC which did evil deeds most directly by dominating the earth. The above part of crescent moons are Hoshinomina(alter ego of the Ohmoto) and the parent of the Ohmoto(the central). Though they have big meaning in the unseen world, they seem not to be shown clearly in the shape even though small angels sometimes enter into them. The wheat of the big circle are all fallen. The middle sized one shows the Ohmoto(the central) and Hoshinomina(alter ego of the Ohmoto). The things which follow behind them seems to be various stars （The solar system）. Many things have been unknown but it is related to the whirlpool pattern which returned to the Ohmoto(the central) shown by the Crop Circle made the other day. Therefore it seems not to be showing the termination of the earth. Those who want to cause wars eagerly for money are dominated from the unseen world. 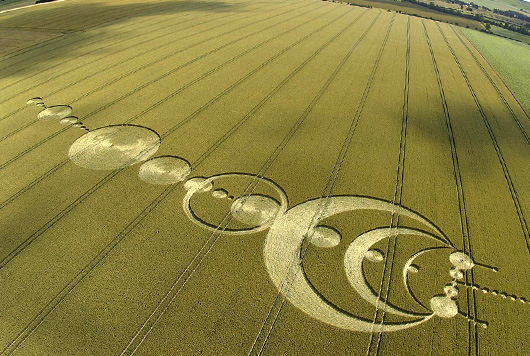 Therefore its Crop Circle firmly inform those who caused wars have to go to the dark world when they go to the world of subconsciousness after death.